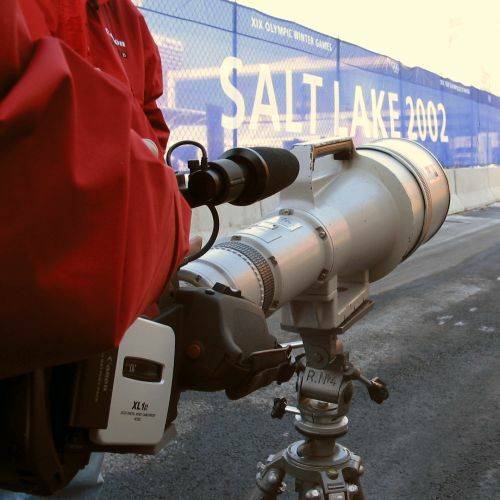 The Watchdog notes: I was very fortunate recently to have been invited to the Canon Imaging Center in Salt Lake City, Utah for the 2002 Winter Olympics. This facility is operated by Canon Professional Services as a courtesy to properly credentialed pro photographers, who may freely check out Canon digital still cameras, DV camcorders and the full array of Canon EOS still photography lenses. 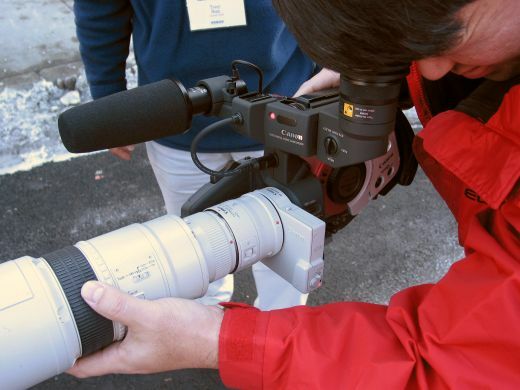 One day I was discussing the merits of Canon EOS lenses on the XL1S, and Dave Metz of CPS suggested trying out the "Big Guy" with the camcorder. 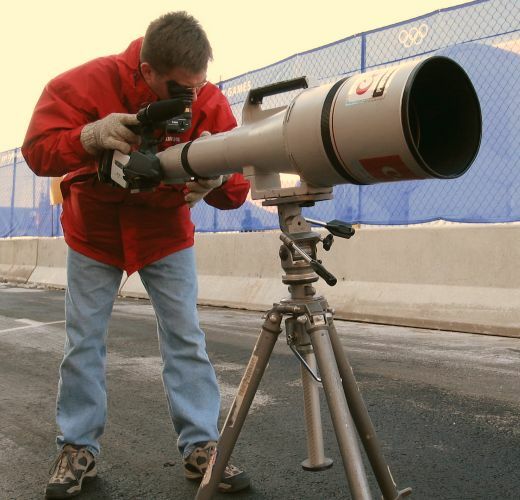 The "Big Guy" is Canon's largest EOS prime lens, a ridiculously huge 1200mm monstrosity. There are only about ten of these things in existence. Sports Illustrated owns two of them. Generally speaking you have to be a major corporation to even think about buying one, as they're individually hand milled in Japan to the tune of about USD$80,000 each. Knowing that I had a rare opportunity here, I thought I would take some photos for all of you to drool over. We had to point this thing down the length of West 200th St. in Salt Lake City, towards the Wasatch Mountains several miles away, in order to see anything through it. Remember that the XL1 EOS adapter multiplies the focal length of any EOS lens by a factor of 7.2, so this 1200mm lens had an effective 35mm equivalent focal length in the neighborhood of 8640mm, which isn't a lens anymore, but a telescope. Kevin Fogarty of Canon Professional Services reads the lower line of an optometrist's eye chart on an office wall about twenty blocks away. But seriously, you could actually see a license plate clearly on a car about a half-mile down the street. We did get the attention of some passing cops; not surprising since this rig looks like a bizarre kind of rocket launcher. Now that's an outrageous amount of glass. The Canon 1200mm prime lens has an aperture of f/5.6; it soaks up a lot of light and needs a bright, sunny day to work well. 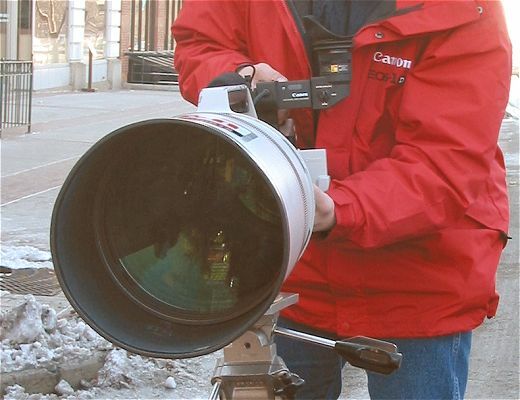 It uses Canon's ultrasonic optical tecnology but does not have image stabilization. It does include its very own heavy-duty tripod. You don't mount this lens to a camera; instead, you mount a camera to this lens. Canon technician Seiji Matsushita observes life on a distant planet. Throwing aside all inhibitions, we've added a 2x extender, which you can see between the back end of the lens and the EOS adapter. This doubles the effective focal length to a 35mm equivalent of 17280mm, yes, there are five digits in that number, which of course is utterly insane. 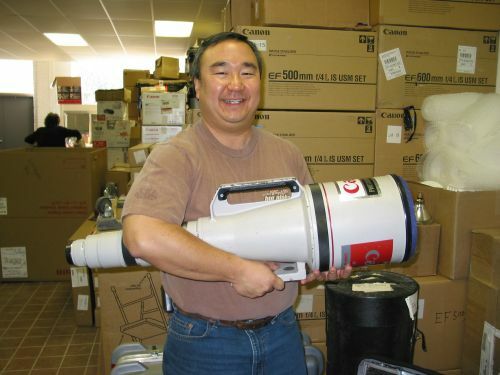 Brian Matsumoto of Canon Professional Services demonstrates the bulk and heft of this gigantic lens. Check out the massive built-in handle. It weighs about forty pounds and has its own hardshell shipping case. Whenever I see this lens, it makes me think it's some moving part off of a battleship somewhere. My thanks to the crew at the Canon Imaging Center for setting up this little experiment for the benefit of the Watchdog. I'm sure an XL1 has been married to the 1200mm lens before, but I've never seen it until now. Hope you enjoy these pics as much as I do! Easy money is like a shadow. The harder you chase it, the faster it moves.